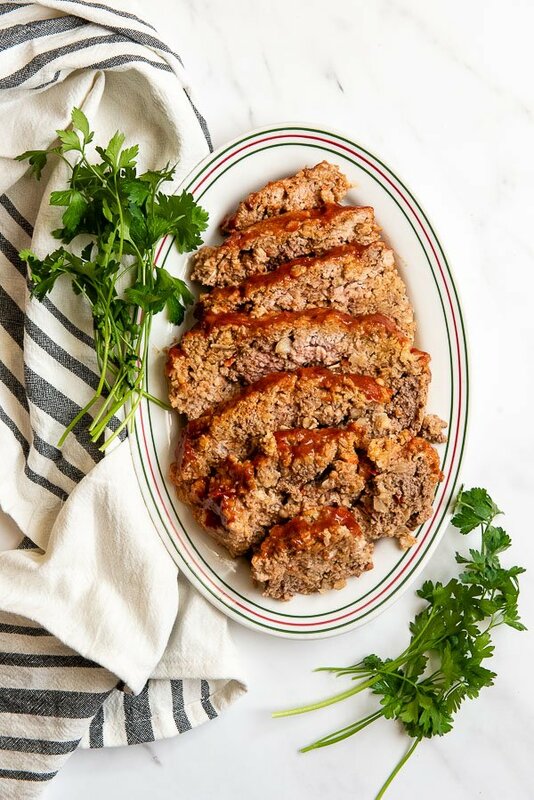 Home-Style Instant Pot Meatloaf turns America’s favorite comfort food into a fast and easy dinner option any night of the week! It’s comfort food season and meatloaf is a classic. With a blend of ground meat and some exciting spices, this satisfying main dish becomes something to enliven your dinner table. Want to know a secret that makes it EVEN better? Making it in the Instant Pot! Pressure cooking the meatloaf makes quick work of dinner prep. It’s on the table in about 90 minutes with only 15 minutes of your personal time! I don’t make meatloaf often but when I was reviewing new Instant Pot cookbook The “I Love My Instant Pot” Gluten-Free Recipe Book” by Michelle Fagone this classic jumped out at me to try. I’ve reviewed other Instant Pot cookbooks by Michelle Fagone and have loved them. 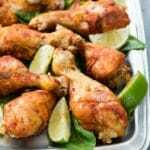 Instant Pot Smoked Paprika & Garlic Chicken Legs and Instant Pot Chili Lime Chicken are two of her recipes that are favorites around my dinner table (and many others based on how many visits those recipes receive)! I hoped making Instant Pot meatloaf would turn out as I imagined and it does not disappoint. It’s a blend of ground beef and ground pork with wonderful spices with a tangy glaze creates a moist flavorful meatloaf in 35 minutes actual cooking time. The cookbook includes recipes for all meals of the day that are ALL gluten-free! This Home-Style Instant Pot Meatloaf is perfect for both those gluten-free and gluten-eaters (a note what to tweak if you don’t need a gluten-free recipe below). The combination of ingredients are key to make this comfort food something exciting. 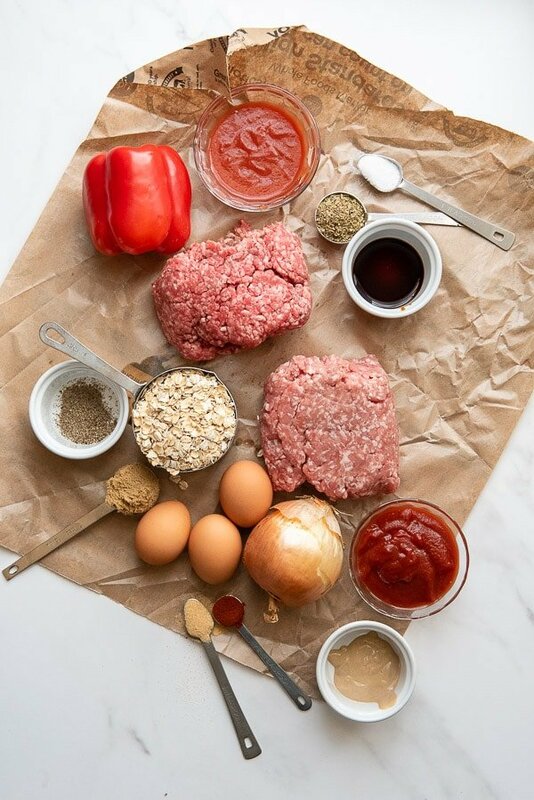 Check the recipe card below for all the ingredients (also shown in the photo above)! TIME SAVING TIP: use a mini chopper to prep the onion and red pepper. 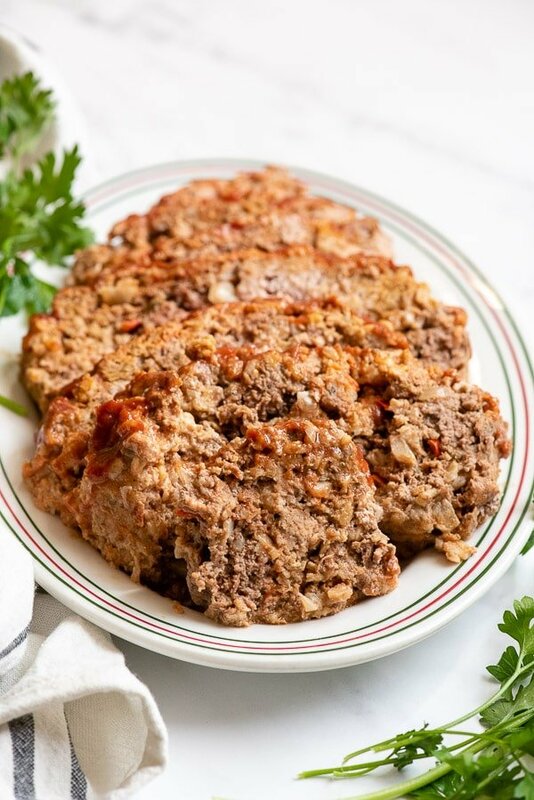 What makes this Instant Pot Meatloaf Gluten-Free? Using old fashioned oats for the binder instead of traditional breadcrumbs as well as Tamari which is a gluten-free version of soy sauce. An important note on oats for those gluten-free: oats themselves do not contain gluten however the way they are grown can introduce gluten. Always select oats marked ‘gluten-free’ for your recipes if following a gluten-free diet for medical need. 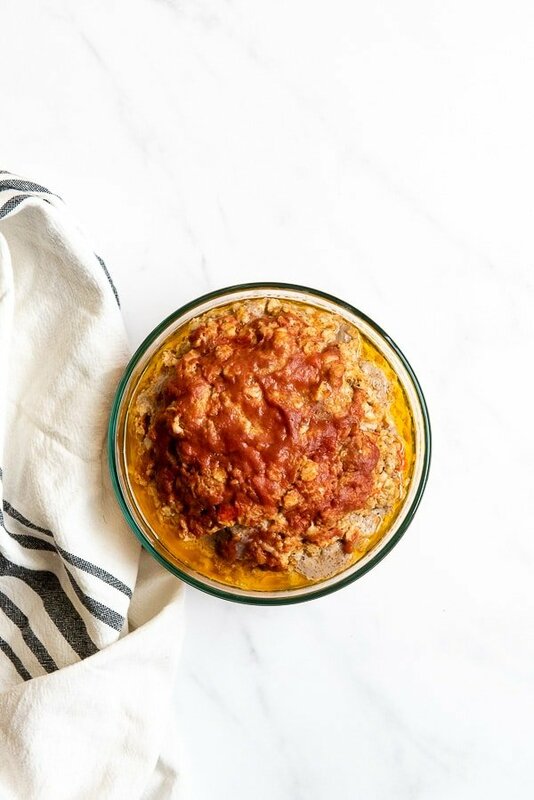 NOT gluten-free and want to make this Instant Pot Meatloaf? Still use old fashioned oats but use traditional soy sauce. How Long Does Instant Pot Meatloaf Take to Make? It takes about 15 minutes to create the meatloaf and 35 minutes cooking time. The meatloaf then has a 10-minute natural release followed by 10 minutes sitting at room temperature (I felt mine could have sat another 5-10 minutes to cool to allow the slices to be released intact). Total time including the Instant Pot coming to pressure would be (estimated) 90 minutes. When the cooking and release cycles are over, there is still steam present after opening the Instant Pot AND the glass bowl will be hot. I allowed the steam to clear for a few minutes and used a kitchen towel to safely grab both sides. There isn’t much clearance between the sides of the bowl and the Instant Pot making grabbing with oven mitts trickier. Another option is to create a homemade foil sling as described in this Lime Cheesecake recipe. Review the instructions in the recipe card, create a sling to both lower the meatloaf into the Instant Pot and out when it is done (the sling stays in the Instant Pot during cooking). Combine the glaze ingredients in a bowl and set aside (photo 1). 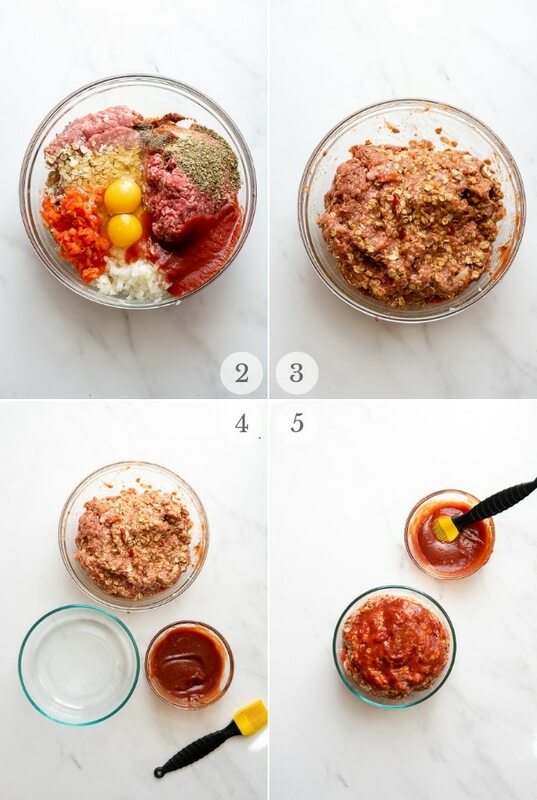 In a large bowl combine all the meatloaf ingredients (photos 2) with your hands (photo 3). Gather a 7-cup glass bowl, the meatloaf and glaze (photo 4). Form a ball and flatten the top of the meatloaf. Place the meatloaf in a 7-cup glass bowl and brush the top with half of the glaze (photo 5). Add the water to the Instant Pot and insert the steaming rack (photo 6). Please the glass bowl with the meatloaf on the rack (photo 7). Lock the lid. Press the ‘MEAT’ button and cook for 35 minutes (the default time). When the cooking completes, allow a NATURAL RELEASE of pressure for 10 minutes followed by a QUICK RELEASE of any remaining pressure. Unlock the lid and carefully remove the bowl with the meatloaf (note: it will be hot and steam will be present). 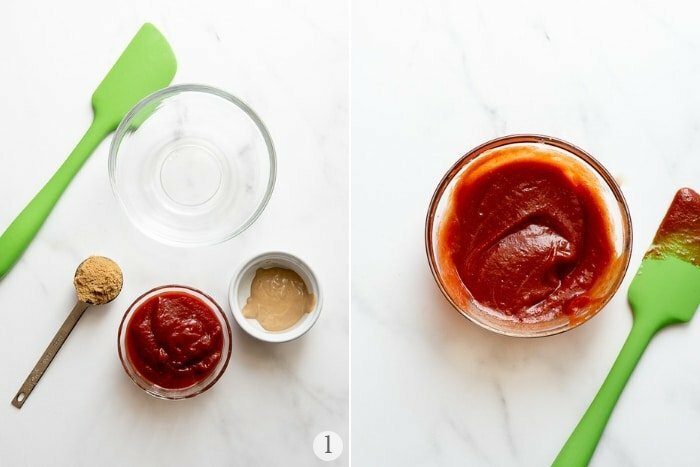 Grab the bowl from two sides with a kitchen towel to lift the meatloaf out. Allow it to cool 10-20 minutes (note: I found after 10 minutes it was still very hot toward the bottom and the slices did not come out fully intact). Gently pour out any excess liquid/fat. Brush on the remaining glaze. Slice and serve the meatloaf. If you’ve made this Home-Style Instant Pot Meatloaf recipe please RATE THE RECIPE below! Disclosure: I received a copy of ‘I Love My Instant Pot Gluten-Free Recipe Book’ for the purpose of review. All opinions are my own. This meatloaf looks amazing! It has been a long time since I made meatloaf for my family. 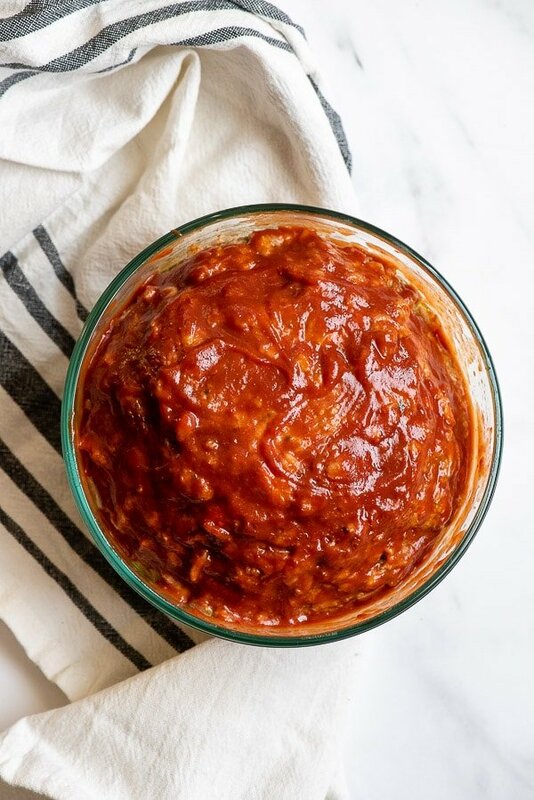 I will have to try making it in the InstantPot soon! Sounds gorgeous! Looks like the ultimate comfort meal, those flavors simply irresistible! I haven’t made meatloaf in ages. This looks like a winner of a recipe, so I’m going to have to make it real soon! Yummy! So easy with the instant pot. I love meatloaf! 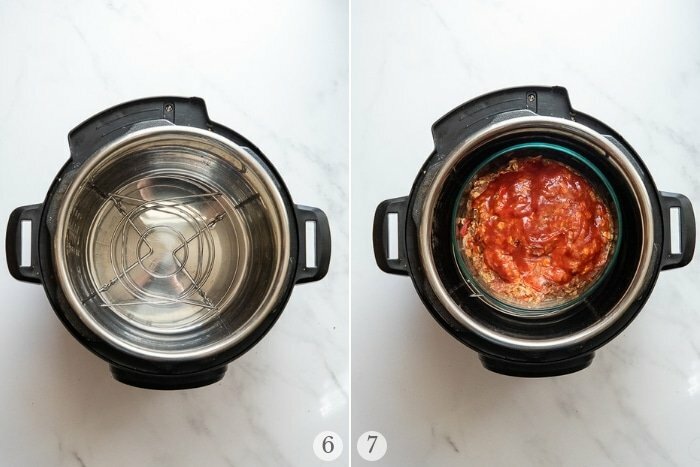 I’ve never even thought of trying it in the instant pot! I bet I’d make it more often. Meatloaf is my favorite comfort meal! I love this recipe! This recipe makes me want some meatloaf. I swear, I am the only person on earth without an Instant Pot! I had no idea I could make such delicious meatloaf in the IP! Thanks! Your meatloaf looks moist and love the glaze! Wow this looks like the perfect meatloaf! I need to try this in my instant pot! This comes out perfect every time! 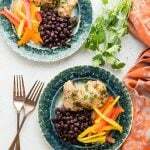 We have made this for dinner in my house, and it’s a big time fave! Oh this sounds wonderful. We’re definitely used to doing meatloaf in the oven and it tends to take a long time. Trying this instant pot method should be nice! Meatloaf is a great comfort food and with the temps getting lower and it getting darker out we need a recipe like this. I need to get an instant pot for a recipe like this. I used to make my meatloaf in slow cooker until I tried your version. I don’t think that I’ll ever go back. This was so superior. Thanks for sharing. Anything fast and easy and so delicious as this is my new favorite! This is the perfect comfort food – and SO easy to make! This meatloaf looks so good! 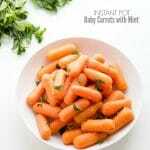 I have to try it in my instant pot for sure! This is why I love using my Instant Pot so much. I can make our favorite foods in so much less time. That is perfect for my scheduled. Yum. Love the glaze on this meatloaf and how quick it cooks in the Instant Pot. 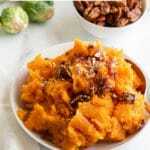 I love the pictures it looks so good and I wish i had an instant pot to make this great comfort meal. Meatloaf is one of my favorite meals. I can’;t wait to try your recipe! 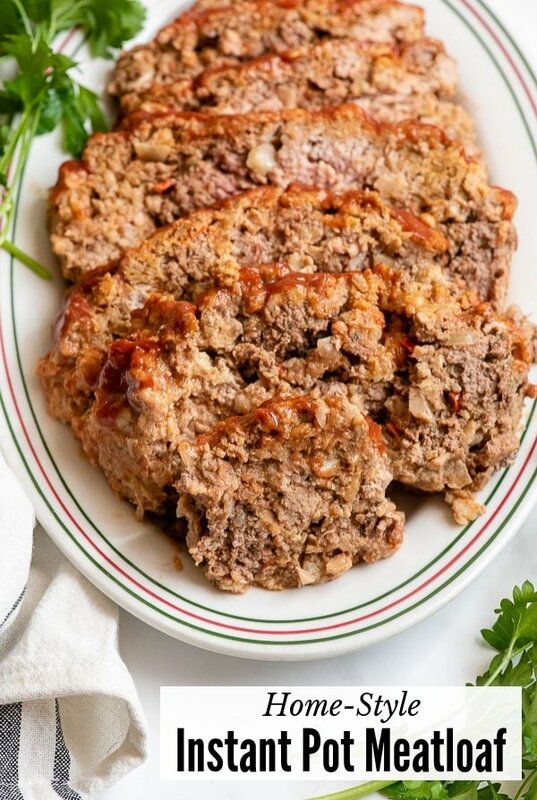 I can never say no to meatloaf and this recipe is a winner!